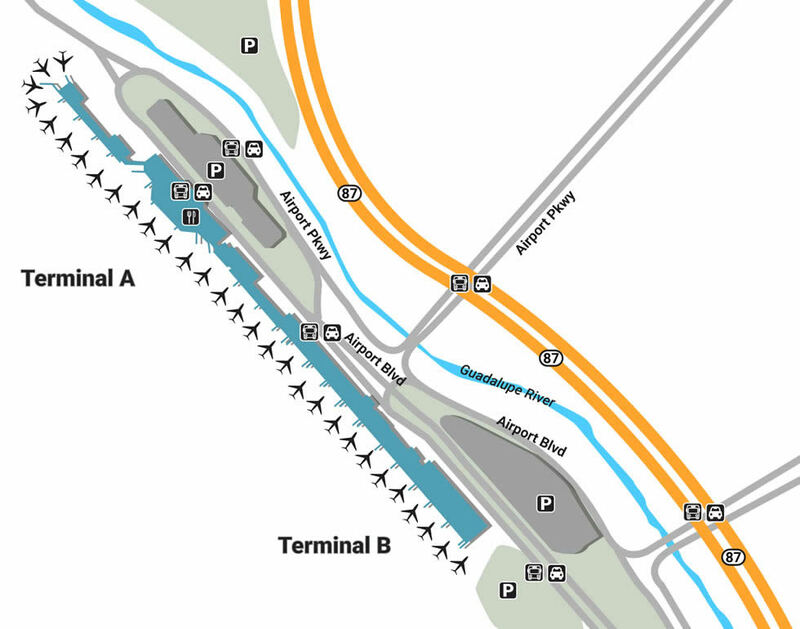 Tourists coming to the San Jose Norman Y. Mineta International Airport can find their way around the terminals and airport by using our maps. The Norman Y. Mineta San Jose International Airport is located a couple miles north of downtown, offering easy access to hotels as well as nearby hotspots, from Big Basin Redwoods Park to the hilly streets of San Francisco. Enjoy your family vacation or unwind before an important meeting by utilizing the services and recreation at San Jose International, each gear working hard to make your stay enjoyable. There are 7 accessible lots throughout the airport, many of which are connected. If you’re in need of a quick pick-up, park free at The Cellphone Waiting Area on Airport Parkway. For short-term parking, utilize either of the three Hourly Lots, each one located along Airport Boulevard with the same flat rate. If you’re planning on leaving for a few days, head over to Daily Lots 4 and 6, also on Airport Boulevard, but slightly further from the terminal. Those intending to leave their cars for several weeks should stay at the Economy Lot, located at 2300 Airport Blvd. From the simple to the extraordinary, San Jose International is beautiful inside and out. This especially comes through the staff’s hard work, which goes above and beyond, whether it be through the Airport Information Booth near Baggage Claim B or Terminal A’s multi-lingual Currency Exchange. There’s also a special Global Entry area for International Arrivals as well as a slue of typical services scattered across the facility, including courtesy phones, paging stations, and telecommunications devices for the deaf. If you find yourself with as many hours as Benjamin’s in your pocket, spend some time exploring your many shopping options. Pick up an interesting read or souvenir at Authors, located near Terminal A’s Gate 10, or enjoy some fresh Sunnyvale fruit from CJ Olsen (Terminal B, Gate 21). For a wide range of local gifts, stop by San Jose Marketplace near Terminal B Baggage claim, or pop into Sunset News (Terminal A, Gate 5) for a huge floorspace filled with magazines, gifts, and snacks. Fill your day with intrigue by filling yourself up on a range of food choices, from tasty snacks to gourmet dinners. Have a sit-down lunch or cup of tea at Brioche Doree Cafe (Terminal B, Gate 23), or turn a late-night arrival into a golden opportunity by grabbing local Italian at San Jose Joe’s right next-door. If you’ve got nothing but time, enjoy endless wine at the Santa Cruz Wine Bar located across the way. If you’re in Terminal A, one of the best places to eat is Sonoma Chicken (Gate 12), famous for their signature rotisserie. If you’re more in the mood for authentic Mexican, head next-door to Tres Gringos’ happy hour.